H.E. 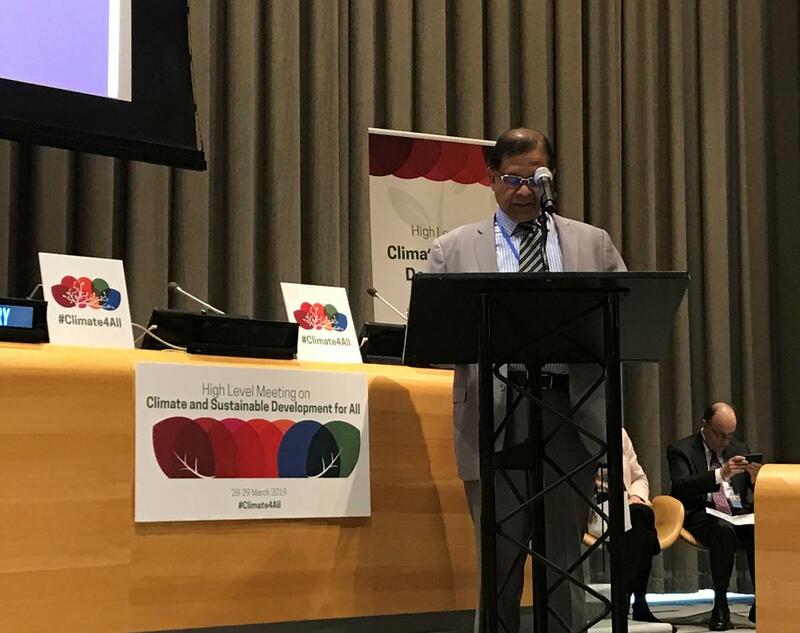 Dr. Rohan Perera, Ambassador and Permanent Representative of Sri Lanka delivering a statement at the Plenary of the High-Level Meeting on "Protection of the Global Climate for Present and Future Generations of Humankind" on 29th March 2019. High-Level Meeting on "Protection of the Global Climate for Present and Future Generations of Humankind"
My delegation associates itself with the statement delivered by the Group of 77 and China. At the outset, let me thank you Madam President for convening this high level meeting. I am confident that our deliberations today will contribute to the forthcoming high level meetings, including the Climate Summit and COP 24. Climate change is one of the most pressing global challenges of our time, which is impacting the world at an unprecedented pace. The complex, inter-related crises of rising sea levels, threatened food production and natural disasters affect the world on a broader and more accelerated scale than ever before. As a country that is facing increasingly frequent and intense extreme climate events and climate induced disasters, Sri Lanka is committed to effective and ambitious action on climate change both at a national and global level. “Let not even a drop of rain water flow into the ocean without being made useful to man"
“Parakrama Samudraya” a great reservoir that is still in use today for irrigation and as a source of drinking water. Sri Lanka has continued with its heritage of conserving water and utilising our precious natural resources in a sustainable manner in order to combat climate change. We have strongly supported and committed to global efforts in addressing climate change by being a signatory to several environment-related international treaties and conventions including the Paris Climate Agreement and the Sendai Framework for Disaster Management. We need to continue utilizing these global mechanisms, meeting our collective commitments, for the benefit of present and future generations of humankind. In addition to our international commitments, Sri Lanka has put together a robust framework of action and climate change instruments within the country. Within this national framework, our priorities include developing policy frameworks and coordination mechanisms for mainstreaming climate action, while strengthening the resilience and adaptive capacity of vulnerable sectors and communities. The Climate Change Secretariat - the National Designated Agency (NDA) for the UNFCCC has achieved several major milestones including the formulation of the National Climate Change Policy, preparing the National Adaptation Plan for Climate Change Impacts 2016-2025 and submitting Nationally Determined Contributions. Additionally, several sectoral plans/programmes of action in Sri Lanka have identified climate change as an emerging threat that needs to be addressed through sectoral policy actions. Some of these include the Coastal Zone and Coastal Resources Master Plan in 2016, the National Biodiversity Strategic Action Plan 2016-2022 Sri Lanka Comprehensive Disaster Management Programme 2014-2018 and the National Action Programme for Combating Land Degradation in Sri Lanka 2015- 2024. Climate change is a very real and persistent threat. The evidence lies in the growing frequency and intensity of extreme climate events, incurring immense losses to economic and social life. While the impacts of climate change are devastating irrespective of borders, developing countries disproportionately face its adverse effects due to higher populations of food-insecure populations, and an increased share of their socio-economic sectors being climate sensitive. As such, it is imperative that developing countries are assisted through sustainable support in the form of technology development and transfer, adequate and predictable financing, and capacity building. Mobilizing stronger and more ambitious climate action is urgently required in order to meet the challenge of climate change and deliver on our national and international commitments.